High levels of quality are essential to achieving company business objectives. Quality can be a competitive advantage and in many cases will be table stakes for success. High quality is not just an added value, it is an essential basic requirement. With high market competition, quality has become the market differentiator for almost all products and services. There are many methods followed by organizations to achieve and maintain the required level of quality. So, let’s review how world-class product organizations make the most out of their QA roles. But first, let’s define QA. Teams and organizations looking to get serious about (or to further improve) their software testing efforts can learn something from looking at how the industry leaders organize their testing and quality assurance activities. It stands to reason that companies such as Google, Microsoft, and Amazon would not be as successful as they are without paying proper attention to the quality of the products they’re releasing into the world. Taking a look at these software giants reveals that there is no one single recipe for success. Here is how five of the world’s best-known product companies organize their QA and what we can learn from them. How does the company responsible for the world’s most widely used search engine organize its testing efforts? It depends on the product. The team responsible for the Google search engine, for example, maintains a large and rigorous testing framework. Since search is Google’s core business, the team wants to make sure that it keeps delivering the highest possible quality, and that it doesn’t screw it up. Even though this seems like a solid testing process, there is room for improvement, if only because communication between the different stages and the people responsible for them is suboptimal (leading to things being tested either twice over or not at all). But the teams responsible for Google products that are further away from the company’s core business employ a much less strict QA process. In some cases, the only testing done by the developer responsible for a specific product, with no dedicated testers providing a safety net. In any case, Google takes testing very seriously. In fact, testers’ and developers’ salaries are equal, something you don’t see very often in the industry. Like Google, Facebook uses dogfooding to make sure its software is usable. Furthermore, it is somewhat notorious for shaming developers who mess things up (breaking a build or causing the site to go down by accident, for example) by posting a picture of the culprit wearing a clown nose on an internal Facebook group. No one wants to be seen on the wall-of-shame! Facebook recognizes that there are significant flaws in its testing process, but rather than going to great lengths to improve, it simply accepts the flaws, since, as they say, “social media is nonessential.” Also, focusing less on testing means that more resources are available to focus on other, more valuable things. Rather than testing its software through and through, Facebook tends to use “canary” releases and an incremental rollout strategy to test fixes, updates, and new features in production. For example, a new feature might first be made available only to a small percentage of the total number of users. By tracking the usage of the feature and the feedback received, the company decides either to increase the rollout or to disable the feature, either improving it or discarding it altogether. Like Facebook, Amazon does not have a large QA infrastructure in place. It has even been suggested (at least in the past) that Amazon does not value the QA profession. Its ratio of about one test engineer to every seven developers also suggests that testing is not considered an essential activity at Amazon. The company itself, though, takes a different view of this. To Amazon, the ratio of testers to developers is an output variable, not an input variable. In other words, as soon as it notices that revenue is decreasing or customers are moving away due to anomalies on the website, Amazon increases its testing efforts. The feeling at Amazon is that its development and deployment processes are so mature (the company famously deploys software every 11.6 seconds!) that there is no need for elaborate and extensive testing efforts. It is all about making software easy to deploy, and, equally if not more important, easy to roll back in case of a failure. Squads. A squad is basically the Spotify take on a Scrum team, with less focus on practices and more on principles. A Spotify dictum says, “Rules are a good start, but break them when needed.” Some squads might have one or more testers, and others might have no testers at all, depending on the mission. 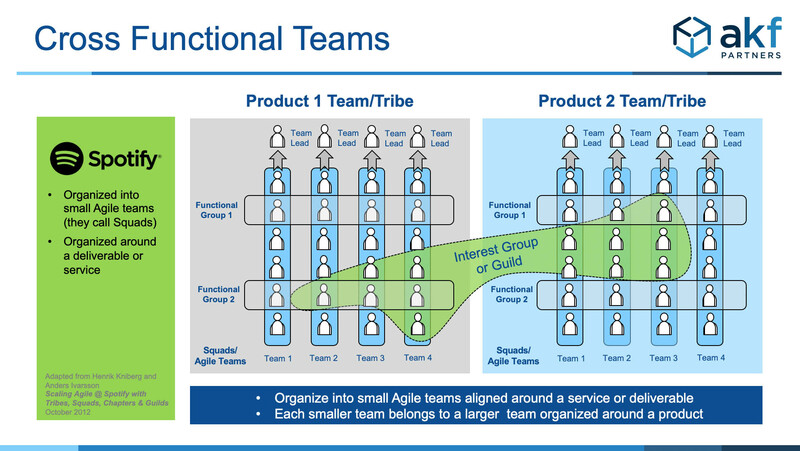 Tribes are groups of squads that belong together based on their business domain. Any tester that’s part of a squad automatically belongs to the overarching tribe of that squad. Chapters. Across different squads and tribes, Spotify also uses chapters to group people that have the same skillset, in order to promote learning and sharing experiences. For example, all testers from different squads are grouped together in a testing chapter. Guilds. Finally, there is the concept of a guild. A guild is a community of members with shared interests. These are a group of people across the organization who want to share knowledge, tools, code and practices. Testing at Spotify is taken very seriously. Just like programming, testing is considered a creative process, and something that cannot be (fully) automated. Contrary to most other companies mentioned, Spotify heavily relies on dedicated testers that explore and evaluate the product, instead of trying to automate as much as possible. One final fact: In order to minimize the efforts and costs associated with spinning up and maintaining test environments, Spotify does a lot of testing in its production environment. Microsoft’s ratio of testers to developers is currently around 2:3, and like Google, Microsoft pays testers and developers equally—except they aren’t called testers; they’re software development engineers in test (or SDETs). The high ratio of testers to developers at Microsoft is explained by the fact that a very large chunk of the company’s revenue comes from shippable products that are installed on client computers & desktops, rather than websites and online services. Since it’s much harder (or at least much more annoying) to update these products in case of bugs or new features, Microsoft invests a lot of time, effort, and money in making sure that the quality of its products is of a high standard before shipping. What you can learn from world-class product organizations? If the culture, views, and processes around testing and QA can vary so greatly at five of the biggest tech companies, then it may be true that there is no one right way of organizing testing efforts. All five have crafted their testing processes, choosing what fits best for them, and all five are highly successful. They must be doing something right, right? There’s a “testing responsibility spectrum,” ranging from “We have dedicated testers that are primarily responsible for executing tests” to “Everybody is responsible for performing testing activities.” You should choose the one that best fits the skillset of your team. There is also a “testing importance spectrum,” ranging from “Nothing goes to production untested” to “We put everything in production, and then we test there, if at all.” Where your product and organization belong on this spectrum depends on the risks that will come with failure and how easy it is for you to roll back and fix problems when they emerge. Test automation has a significant presence in all five companies. The extent to which it is implemented differs, but all five employ tools to optimize their testing efforts. You probably should too. Bottom line, QA is relevant and critical to the success of your product strategy. If you’d tried to implement a new QA process but failed, we can help.